This unique and wonderful venue is deservedly a very popular place for Weddings in Northumberland. 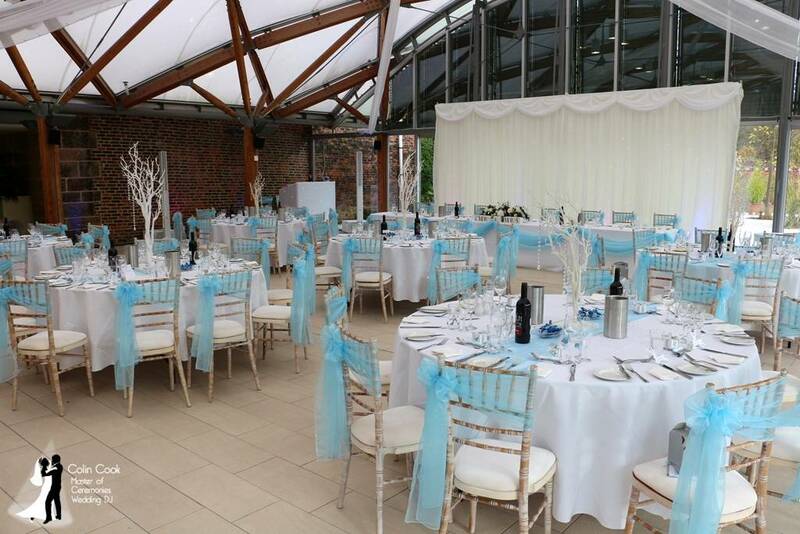 The Pavilion is an incredible glass, steel and wood structure overlooking the fabulous Alnwick Gardens with the impressive Grand Cascade. The Treehouse, one of the largest in the world is amazingly unique with incredible character. 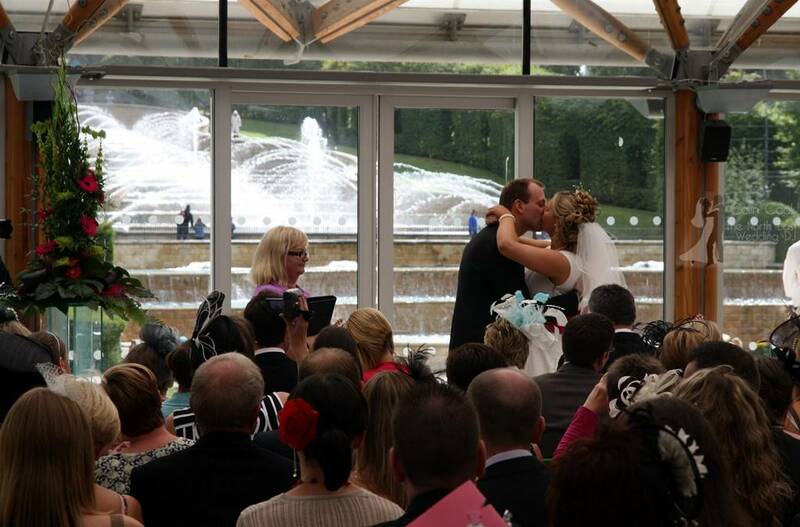 The Pavilion is licensed for ceremonies so you can actually get married with the Cascade as a backdrop to your wedding ceremony!With over 100 weddings under my belt in this venue I know the space extremely well and over the years have fine tuned the services I offer to be a perfect fit here. 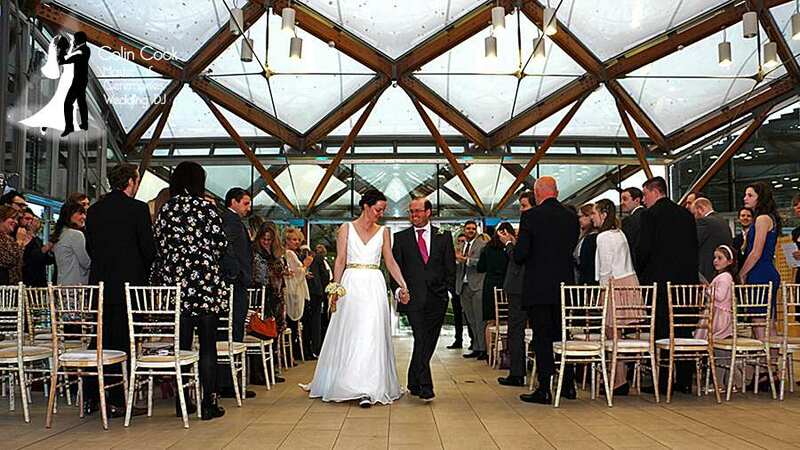 In fact Alnwick Garden has been one of my driving forces in terms of developing new services to complement the building and the Couples who choose this amazing venue for their Wedding. I’m delighted to have been the Recommended Wedding DJ, Master of Ceremonies and Creative Lighting Supplier to Alnwick Garden since they started doing weddings back in about 2008 right up until the Duchess of Northumberland sold the Events Concession to Ramside Event Catering in 2014. Although Ramside now offer their own ‘packages’ to their clients I continue to work there on a regular basis for those Couples who prefer a more bespoke, unique and personalised Wedding Day. 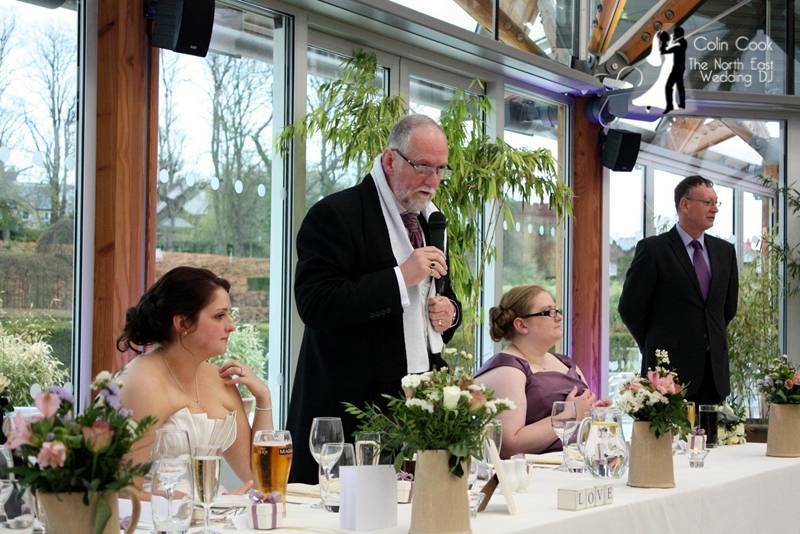 This also includes Weddings at lovely Alnwick Castle and of course at the gorgeous and atmospheric Alnwick Treehouse. In fact almost all of my clients at Alnwick Garden book me for their entire day so it makes sense, rather than to just list what I do, to walk you through a typical Wedding timeline at Alnwick Garden. 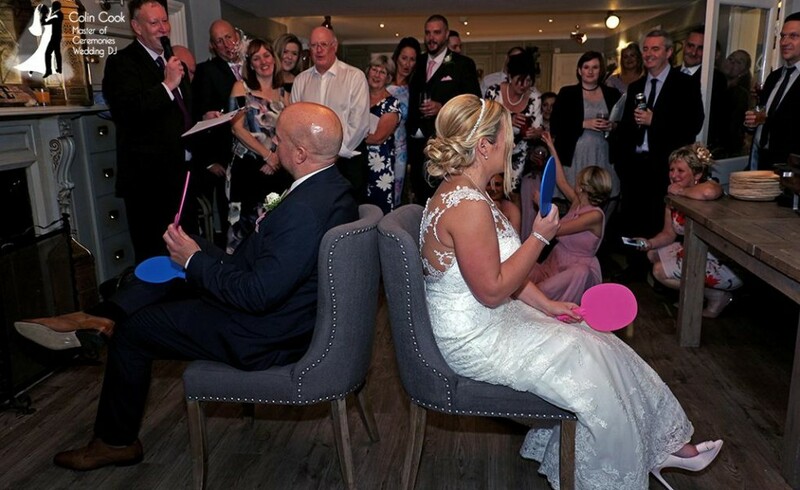 When I say typical it really does just mean the timeline rather than the day itself as this venue attracts a huge variety of fabulous Couples with an equally wide range of requirements. In fact the diversity of this venue is such that to date I have performed (in addition to English Weddings) American Weddings, Indian Weddings (including a full Hindu Ceremony! ), Danish/English Weddings (one of the most enjoyable Weddings of my career! ), French, Canadian, Sikh, Scottish and various other nationalities and fusion weddings! Musical tastes have been equally diverse here and I have performed at Metal/Heavy Rock Weddings, Power Ballad Weddings, a 70s Disco Wedding, 90s Boy Band Weddings and pretty much most things in between! Anyway – back to a Day in the Garden! My day starts bright and early when I load up and drive the 2 hours up to Alnwick, generally arriving between 9 and 9.30 (there is no vehicle access after 10am and it is a heck of a push to ferry equipment from the car park!). Equipment unloaded into the Pavilion and the van moved back around to the car park. We then install the Moodlighting around the outside of the room. Taking a creative stance rather than counting units (but there are usually about 22-24!) the lighting is neatly placed to uplight the wooden boundary pillars, metal risers and the brick far wall. It runs from the Atrium door around to the left, right around the room and back as far as the top of the staircase. Alnwick was the venue which launched my Uplighting service as it became so popular, so quickly. Although the room is gorgeous and airy through the day, once darkness falls the beige floor and glass surround can look a little dull. The gas-type room lighting doesn’t help but the Uplighting just completely lifts the room and creates an incredible atmosphere with a real WOW! Factor. The lighting glows through the roof and can be often seen from the car park as your guests arrive for the evening. Power sockets are not in the usual places in the Pavilion (as the walls are glass!) so the lighting is low energy and all runs easily from a single socket in the far corner where I set up. Whilst my assistant installs the Uplighting I set the sound system up. Most clients choose the white rig to blend in during the day. Of course no disco lights are installed – not until the evening! Lighting on, sound checks donewe are now ready for guests to arrive for your Ceremony. Time for a coffee and to get changed before guests start to arrive. Whilst we are setting up, the excellent staff at Alnwick will be setting up for the Ceremony too. Once set the room always looks incredible! When your guests start to arrive I ensure everyone knows where they should be, help direct guests to the facilities etc. The Registrar arrives and we have a chat – (I know most of the Alnwick, Berwick and Morpeth Registrars so they know there will be no problems with the music), then everything clicks into place for your wonderful Ceremony. 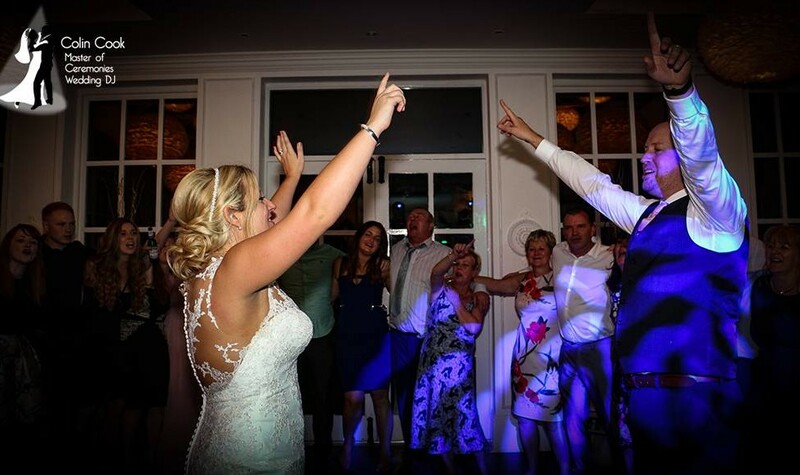 Music is spot on and at the perfect volume, faded and cued professionally to your requirements (unbelievably some venues will play your ceremony from a phone!) and you walk out to your Drinks Reception as a newly married Couple! After speeches I play music for your Wedding Breakfast which can include your own requests or tastes. I get a lot of comments on the music I play during the Wedding Breakfast. Keeping the music upbeat but at the right volume, ensuring that all tastes are catered for and keeping the atmosphere lively but relaxed is the key here. Many venues, couples and even DJs make the mistake of playing slow downbeat music during the Wedding Breakfast. With a long day, the heat of most venues, lots of food and alcohol this is a sure way to kill the atmosphere and make your guests tired and almost comatose. I also have other ways to keep the atmosphere going and to involve all of your guests, ensuring that things are kept lively and interesting – especially important if the weather is inclement and whilst plates are being cleared between courses etc. Following your Wedding Breakfast I will ask your guests to vacate their tables so that the staff can turn the room around (again) for the evening function and Disco. If you also have a band playing this is when they will turn up. At this point your guests are free to roam the gardens (light permitting) or to pop back to their accommodation to freshen up and prepare for The Party! For the evening reception I strongly suggest paying some attention to table layouts as due to the size and layout of the room the ‘default’ isn’t always the best way to get a great party going. Just chat with me if you need any help or suggestions. Once the evening starts and all of your guests arrive, you’ve had plenty of time to catch up with your guests and any additional evening ones then it is time to cut the cake and have your First Dance as a married couple! This is done with a style, humour and atmosphere which suits you. As your DJ for the evening I’ll be entertaining your guests with some great music and of course am happy to accommodate your pre-chosen selections as well as take requests on the night. I’ve had some amazing nights at Alnwick! Although the Pavilion is often hired out for a 1am finish any amplified music has to stop at midnight. So ensure you don’t book and pay entertainers for a 1am finish as they’ll be expected to stop at midnight. 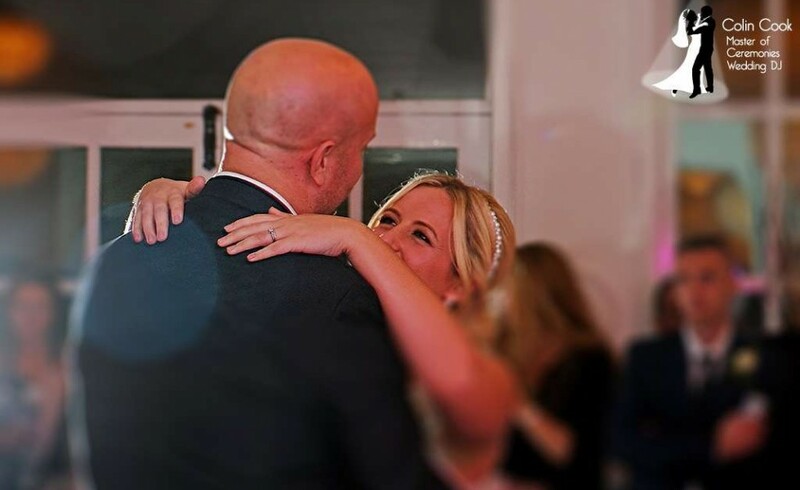 I have a special way to finish the evening for Weddings and The End of Night Proceedings ensure that your guests leave still singing, dancing and with fantastic memories of your incredible Wedding Day.